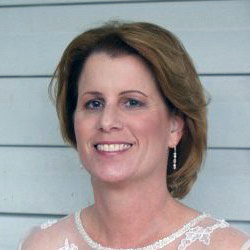 Julie Ann Cossette, 57, of Stafford passed away peacefully after a courageous battle with breast cancer on Friday, February 1, 2019 at Stafford Hospital. Julie was born on September 13, 1961 in Poughkeepsie, New York to parents Lee and Annette Rogers. She enjoyed a wonderful marriage for over 10 years with Steven Cossette, and raised two children, Kristen Smith and Sarah Rogers. Julie graduated from Sanderson High School in Raleigh, North Carolina, and later received her bachelor’s degree from Appalachian State University in Boone, North Carolina. Julie is survived by her husband, two children, two stepchildren, parents, and 10 grandchildren who lovingly knew her as “Mocha”. She was preceded in death by her brother, Todd Rogers, and her niece, Ashley Rogers. Known as a strong, selfless, courageous, and steadfast woman, Julie touched the lives of many during her life. Julie worked for Stafford County Public Schools for 25 years, first as a Computer Technician Trainer, and later earning a position as a Network Engineer. Julie saved teachers and schools from technology meltdowns throughout her career. Julie was also an avid quilter, a talent which she passed down to her family. She enjoyed nothing more than spending quality time with her family and friends. A Celebration of Life will be held from 1 to 4 p.m. on Saturday, February 9 at Rock Hill Plantation House in Stafford.